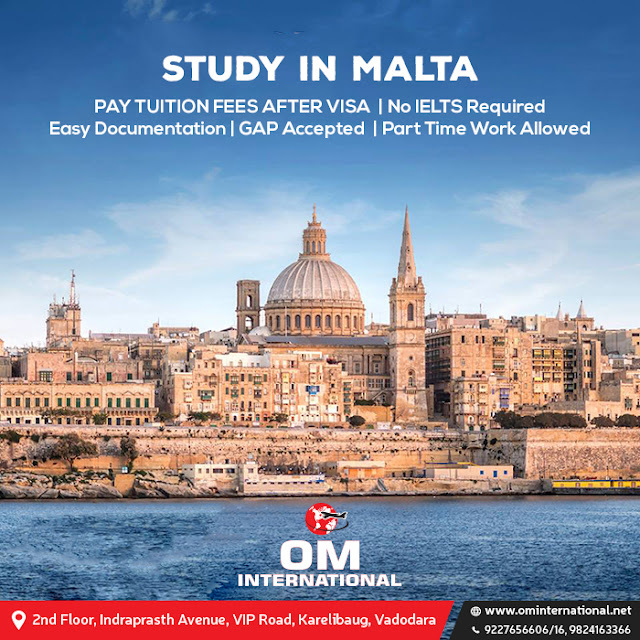 OM VISA Consultancy - Global Immigration, Students, Visitor, Business & Work VISA Consultants: MALTA student visa is at your reach with OM INTERNATIONAL a Leading consultancy...!!! MALTA student visa is at your reach with OM INTERNATIONAL a Leading consultancy...!!! Welcome, Om International will provide you with some advice and useful information when studying and living in Malta. In preparation for your visit, international inspire you to familiarize yourself with this guide which advice helpful checks you can make before traveling to Malta and how best to take care of yourself and your belongings during your visit. Malta is an archipelago with three main islands (Malta, Gozo, and Comino), located in the Mediterranean Sea, south of Sicily. Only the three main islands are inhabited. Its total area is 316 square kilometers. The islands consist of mainly low, rocky, flat dissected plains with many coastal cliffs, numerous bays, and good harbors. Valetta is the capital. Surrounded by water, Malta has a Mediterranean climate with mild, rainy winters and warm, dry summers. Annual rainfall is low, and generally, there’s lots of sunshine. Malta is an ideal choice for students who want to combine study with tourism and leisure. One of the reasons why students get attracted to this tiny nation for purposes of education is that it has a uniqueness that is typical of many an island. There are three levels of education: primary, secondary, and tertiary (including higher and vocational training). The education system in Malta is based on the British system. In primary and secondary, students can go to state, private/religious schools, or international schools. From 2018 students from 16 years old are allowed to work 20 hours per week in Malta while they are studying. The purpose of this new measure is to attract more people for studying programs in the country. If you intend to study and work in Malta, Om International Visa consultant will give you all the information you need. A few considerations must be taken. Only students who will be in Malta for an initial period of at least 3 months will be able to apply for the Work & Study Visa as they can only work after their 90th day (3 months). Which means if your course lasts 4 weeks, you won’t be able to apply. In any case, the students will first be givens Student Visa. In other words, the wait for the processing of employment license in Malta takes from 4 to 6 weeks. This means that students can only start working from Week 13 (after their extension visa has been given). The license is granted for a maximum of 1-year visa. Over 1 year, the student has to apply for the residency permit and apply for a job through that scheme. The student needs to find a job In Malta first (by himself/herself) and then s/he can apply for a work license which is issued for the duration of the validity of the visa. On the license, there will be the start and end date of employment, employee’s name, job status, and employer’s name. The license is only valid for the work and company that it has been issued for. A unique feature that comes to the fore is the acceptance of a third country language as a language that is taught, which will make the inhabitants of that country feel comfortable in Malta. This is evident in the acceptance of Mandarin Chinese that can answer apprehensions about Why to Choose Malta for higher study. The largest of these is the University of Malta, a publicly funded university which has around 11,000 students, including about 700 international students. The university’s main campus is in the harbor area of Msida, just to the west of Valletta. There’s also a smaller campus in Valletta and another on Gozo, the second largest of the Maltese islands. The public university system in Malta also includes the Malta College of Arts, Science and Technology in Paola (just south of Valletta) and the Institute of Tourism Studies in St Julian’s (to the north-west). Along with the University of Malta, all of these participate in the EU’s Erasmus exchange program and the Bologna Process for compatibility of higher education across Europe. The official teaching language is English, though international students are also encouraged to learn Maltese. The arts have always played a significant role in Maltese culture. Cultural events occur frequently. Theater and music are extremely popular. Maltese food is traditionally the Mediterranean, using fresh, seasonal, and locally available produce and seafood. Today, an eclectic mix of dishes drawn from other cuisines, especially those of Sicily and Southern Italy, infuses traditional Maltese cuisine. A rich pattern of traditions, beliefs, and practices run through Maltese society and culture. The culture has evolved over time from adapting and assimilating diverse influences including Semitic, Latin European, French, and the British colonial legacy. The Latin European heritage command due to its ongoing influence over eight centuries and the fact that Malta contributes the religious beliefs, traditions, and customs of its Sicilian and Italian neighbors. Maltese historic venues are often hosting to outdoor theaters and concerts, and the vibrant calendar of Malta does not stop there. Annual events such as the three-month summer festival and the international jazz festival by floodlit Grand harbor in July also keep the Maltese occupied on their free time. Nightlife is also very up and coming in Malta, Paceville and St Julian's are the center of the scene inviting DJ´s from all over the globe. For an extra special night out do not miss the summer fiesta providing your senses with fireworks, food, and fun all night long.